The numbers may look identical. But it was not the same bombing. Early last week, the Times' Stephen Lee Meyers, based in Iraq, reported (and I commented on) the bombing in Tikrit that took roughly 50 lives--give or take a dozen, more likely give. The number of wounded was, of course, enormous and also uncertain. Alas, the Times news staff in Iraq is getting basic training in how cruel people can be to one another. On Thursday, John Leland, like Meyers, a brave and careful correspondent, brought us the grim news that 52 Iraqis in pilgrimage to the Shi'a holy city of Karbala were taken out in a series of three car bombings. About 150 people were wounded, just about the estimate for the wounded in Tikrit. Roughly 10 million Shi'a are expected at the shrine in the holiest days of their calendar. They are praying for the return of the "hidden Imam," the "guided one." Maybe soon. Maybe not at all. One would think that the expectation of murder along the route would diminish the number of pilgrims going to Karbala. But Shi'a spokesmen (appointed or self-appointed) point out that faith carries them on. I do not know how many Shi'a have been murdered since the "mission" was launched some eight years ago. And since President Obama also seems to think that the mission has now been "accomplished" I wonder, what with these kill numbers, would constitute failure. It is not just the Shia who are victims of violence. 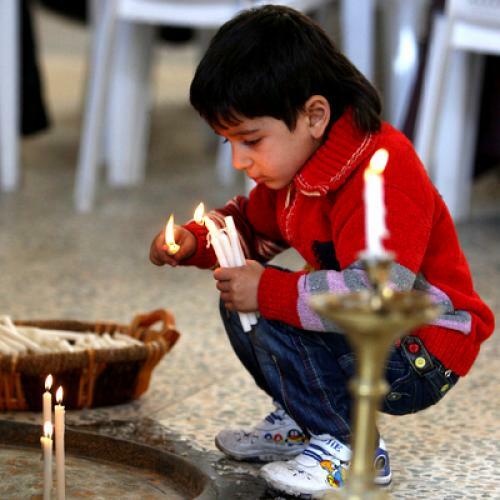 No group right now may be suffering more in the Middle East than Christians. In last Wednesday's Times, Leland and his colleague Duraid Adnan wrote about how "the last Christian man in town," Habbaniya Cece, Iraq, "goes to church to clean the building and to remember the past." But this is not the only town which a whole variety of Christian sects have deserted. The lone Christian man may be a touching symbol, and I don't mean to be cynical about this. But Iraq is being drained of its Christians the way a soldier who's been shot has his blood slowly drained from his body. The anti-Christian impulse has now translated into what is really a wave of pogroms, not less brutal than those that assaulted the Jews at the cusp of the twentieth century in the Ukraine and in Russia. Even the European Union, weak though it is, has raised a timid protest against the persecution of Christians in the Middle East. So not only in Iraq, but also in Iran , Nigeria ,"Palestine", Egypt. After the firebombing of Coptic churches in Egypt and the riots that followed them, Pope Benedict issued a typically cautious statement asking Middle East government "to do more to protect Christian churches" in their countries. In a huff, Cairo immediately withdrew its representative from the Vatican, calling the request of the Vicar of Christ "unacceptable interference". But the real storm came later. Days after, the Islamic University of Al-Azhar, the oldest Muslim university and the highest authority in Sunni Islam, with its seat in Cairo, also cut off contact with the Holy See because of what its supreme council found unacceptable. The Pope had said there was a "strategy of violence" afoot in Islam but that Christians should respond to it only with non-violence. If anybody remembers Barack Obama's June 4, 2009 speech to this Islamic institution they should be shocked at how cavalierly he threw compliments at it: "For over a thousand years, Al-Azhar has stood as a beacon of Islamic learning..." (I've written about this tawdry piece of oratory several times.) But the fact is that it is not a beacon of anything save narrow dogma. This is only a sign of how little the president understands the societies and the ruling groups he is trying to flatter. (Perhaps some real scholar--not Karen Armstrong or Juan Cole or John Esposito with their idealizations of past and present--should have another look at Obama's much praised Cairo text .) Moreover, the statements his former press spokesman Robert Gibbs and that he himself have made about the victimization of Christians in the arc of Islam were actually understatements. And understatements under these conditions are falsehoods. He who denies the brutal realities--or even casually minimizes them--it is as if he is an accomplice to them. Nobody has come up with a strategy for ending or even lessening the killing of Christians. Maybe there isn't even a tactic. But, then, one has to face the facts and the consequences, the worst being that Arab societies are emptying themselves of Christians more or less as Europe emptied itself of Jews. It was easy then: Europe had no particular sympathy for or empathy with its Jews. It wasn't as if the Europeans didn't know that Jews were being murdered or, more gently, simply being pushed out. It was just that they didn't care. There are various depopulating processes now going on against Christians virtually everywhere in the Muslim Middle East, including notably Bethlehem where Jesus was born, this particular end-stage of religious history having started when Yassir Arafat's authority took over. And the truth is that nobody cares much about Armenian, Greek or Roman Catholic Christians. Yes, like they didn't care about the Jews. Maybe it is not quite a Holocaust. O.K., no damn exaggerations. It is just a catastrophe, a human, historical, demographic, religious catastrophe. Feel better?